Rebuilding Together Twin Cities hosted a community revitalization project to rehabilitate six homes and develop a community garden in the Bryant neighborhood of South Minneapolis. The community garden will give neighbors access to fresh produce, which is extremely limited, and offer opportunities to connect to their neighborhood. For the past 23 years, Rebuilding Together has partnered with the NFL to host projects in Super Bowl cities. These NFL-sanctioned events provide critical home repairs to neighbors in need and their communities. The event provides critical home repairs to people in need and addresses health and safety concerns. The Bryant neighborhood of South Minneapolis will be stronger with a more vibrant community. Lowe’s supports Rebuilding Together with hundreds of annual projects and marquee events like Building a Healthy Neighborhood and Kickoff to Rebuild. Since 2007, more than 1,620 Lowe’s Heroes have served our niehgbors in need all over the U.S., logging in more than 43,920 volunteer hours to serve our mission. 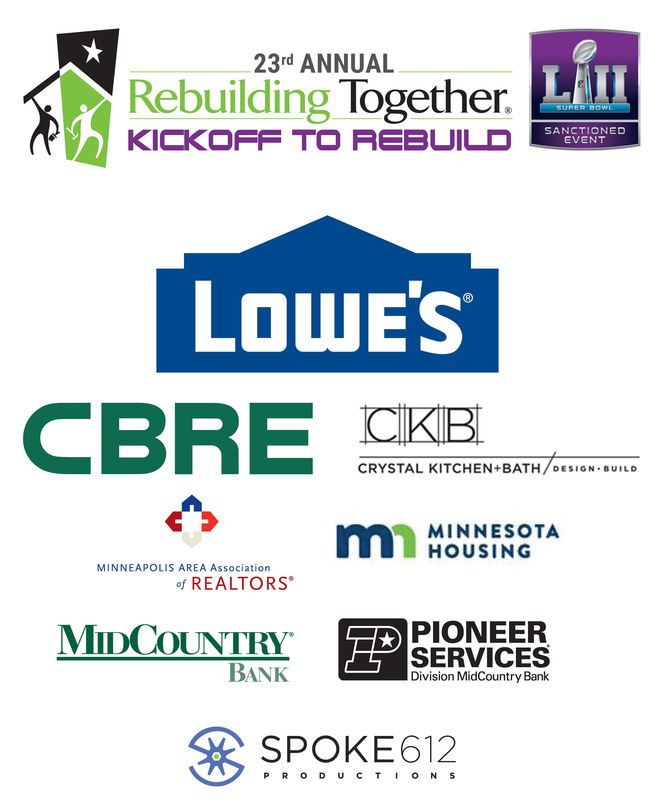 Additional sponsors for Kickoff to Rebuild include: CBRE, Crystal Kitchen + Bath, Minneapolis Area Association of Realtors, Minnesota Housing, MidCountry Bank, Pioneer Services and Spoke 612 Productions. Kickoff to Rebuild is an annual NFL-sanctioned event hosted by Rebuilding Together. For the past 23 years, Rebuilding Together has partnered with the NFL in Super Bowl cities across the country, rebuilding houses and bringing together neighborhoods. Together, we have repaired nearly 140 homes, engaged 5,000 volunteers.